First implemented in 2001, the roadless rule prohibits the construction or expansion of roads on certain tracts of undeveloped land in national forests. The rule aims to protect sensitive habitats and wild areas, as well as to conserve natural resources—an obligation that is part of the U.S. Forest Service’s (USFS) mandate to manage public land for multiple uses.3 The rule has been especially contentious in the Tongass National Forest, because it reflects a shift from the long history of subsidized logging of the Tongass’ old-growth forests and toward a more sustainable management approach that capitalizes on the region’s globally unique ecology. The Trump administration’s proposed change to the roadless rule is just the most recent example of the USFS’ reliance on an antiquated strategy: managing the Tongass for timber, an industry that accounts for not even 1 percent—less than 400—of southeast Alaska’s jobs. More profitable industries, on the other hand, such as tourism and commercial fishing, together generate more than $2 billion in revenue annually and employ more than 10,000 people in the region.4 The Trump administration’s move to expand logging in the Tongass follows decades of the federal government subsidizing timber sales in the national forest, often to the tune of more than $20 million per year.5 These subsidies became news yet again this summer when a controversial southeast Alaska timber sale, promoted heavily by the USFS, received no bids, despite significant federal subsidies that included USFS investments of $3.1 million in new roads.6 Despite the expense to taxpayers, the USFS estimated the sale would generate just $200,000 in revenue. 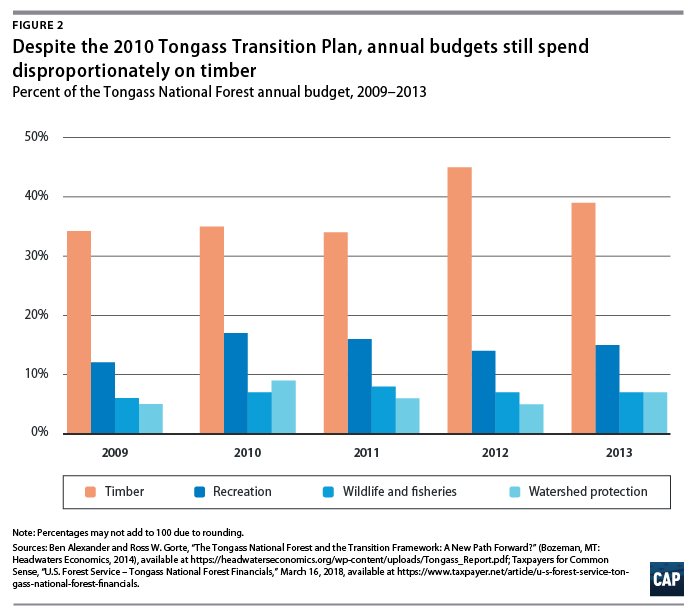 The situation underscores how focusing on timber production in the Tongass wastes vast amounts of taxpayer money in pursuit of limited returns. 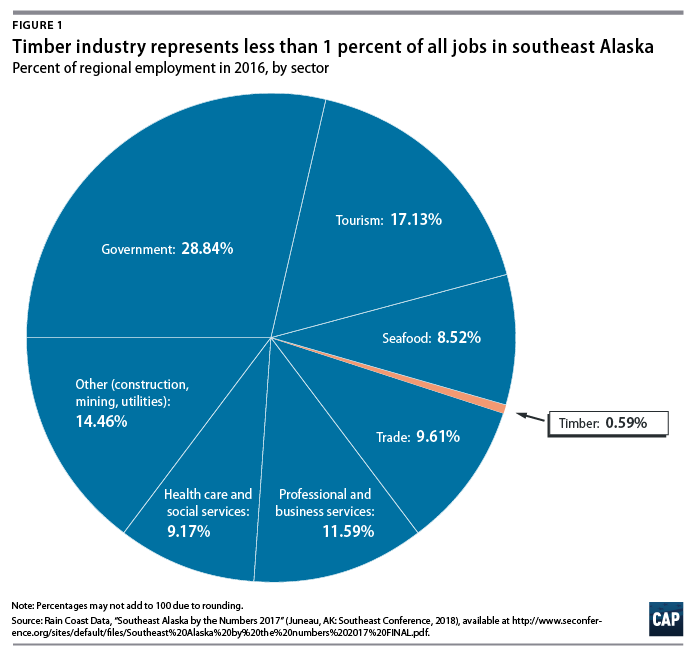 At the same time, this timber-centric approach neglects the opportunities that the Tongass creates for other industries, namely commercial fisheries and tourism, which, as noted earlier, are cornerstones of southeast Alaska’s regional economy. By the 1990s, the economic realities of subsidizing timber harvests in the Tongass had become clear. Decades of logging had not generated significant local employment to justify the disturbances that were being made to the forest. The two large contracts were ended in the mid-1990s, followed by closures of the two mills they had supplied.16 At the same time, the health of the regional economy hinged increasingly on the commercial fishing industry and a growing tourism industry, drawn to the region by cruises, sport fishing, and other outdoor recreation opportunities that rely on a natural, undisturbed Tongass. This stretch of continuous losses reflects the dedication to logging by the state and the timber industry, which has persisted despite clear economic realities. For decades, high harvesting costs and low timber prices have meant that the Tongass acts as a so-called last in, first out supplier for wood products markets in the western United States, providing material only when market demand is very high.25 This lack of consistency means the USFS cannot sell enough timber to meet its production goals—despite federal subsidies and occasionally dubious sale practices—and runs counter to the argument that the USFS’ focus on timber is a reasonable approach to the region’s economic needs. Meanwhile, the USFS has continued to prepare old-growth timber sales. Most recently, it has attempted sales for old-growth timber on the uninhabited Kuiu Island on multiple occasions but have thus far received no bids.28 The timber sale lies in an area of Kuiu that contains one of the most important watersheds for salmon production in the Tongass.29 Despite the fact that the sale is only estimated to generate $200,000, the agency is planning the construction of a $3.1 million road to access the site. In addition, the USFS has already granted a waiver to allow timber logged on Kuiu to be exported to mills overseas for processing immediately following harvest.30 This waiver applies to rules meant to support U.S. timber jobs. These rules are in place for every national forest but are often waived for timber sales in the Tongass to attract logging companies. Timber logged in the Tongass won’t sell without the waiver, because high costs of harvest and low demand make it unprofitable to harvest and process the timber within the United States. Moreover, exporting timber creates only limited local jobs through logging, while the added employment created by mills is largely developed outside the United States. Instead of focusing on the empty promise of old-growth logging, Agriculture Secretary Perdue and the USFS should make real investments in the types of forest management that are cost-effective and proven to support the economy of the southeast Alaska region. Recreation and tourism should also receive greater investment and support. It is estimated that outdoor recreation supports roughly 72,000 jobs in Alaska—more than oil, gas, mining, and logging, which together support just 15,000.38 The Tongass, and southeast Alaska more generally, play a key role in the health of the state’s tourism industry, as cruise lines bring visitors to fish, hike, and explore the region’s cultural and natural history.39 Investments in tourism infrastructure, including cabins, trails, and facilities for cruises, would have a much greater economic impact than logging. That said, there is still some opportunity for timber production in the Tongass but not in places with high-value salmon habitat or where the roadless rule has protected old-growth trees. The USFS recently approved one such project on Wrangell Island.40 It includes the harvest of younger-growth trees, with a focus on production to meet local and regional demand. This type of project should be a priority for the USFS; it supports timber jobs and the region’s small mills, as well as compensates, in part, for the impacts of past logging projects on the forest landscape, creating spillover benefits for the region’s ecology and economy. Another positive step is the USFS’ commitment to use local wood products for tourism infrastructure such as cabins, and to work with the Rural Development Office and local businesses to develop processing capacity for small-diameter logs.41 These objectives—and investment in projects that complement existing tourism operations, such as trail infrastructure and support for private guide businesses—are much more likely to generate a return than any old-growth sales. After years of favoring timber over more productive industries, federal agencies and Alaska’s representatives should acknowledge the writing on the wall. 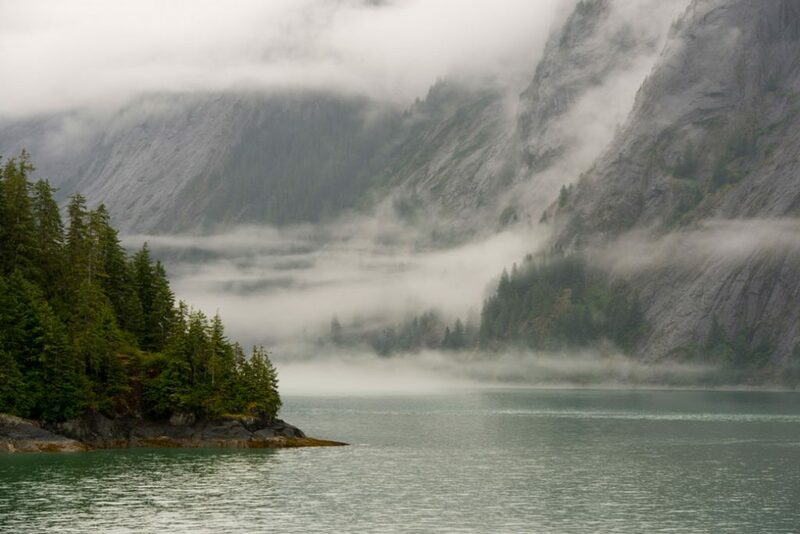 Instead of pursuing a flawed revision to the roadless rule, they should work to direct federal investments to the proven approaches that draw on the real values of the Tongass National Forest to support local communities. The author would like to thank Matt Lee-Ashley, Sally Hardin, and Jenny Rowland for their contributions to this issue brief.